Nice to know that, even a decade after its launch, the iBook is still used in interior decorating – at least by the folks at Target. The iBook G3 was one of the few classic Macs I’ve kept. Dan Benjamin and John Siracusa were talking about the lack of durability in modern Macs. I think that the G3 iBook is one of the toughest little machines Apple’s ever made. So tough, in fact, that it can survive in a hypothetical teenager’s bedroom, as seen above. Posted by davelawrence8 at 8:03 pm on February 14th, 2011. 2 comments... » Categories: ibook, lowend, macs. 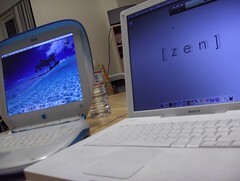 Tags: blueberry, clamshell, G3, ibook, interior design, target. Subscribe via RSS. We seem to be in a constant state of list mania in the Newton world, and Mac|Life adds to it with a list of the top five best and worst Apple laptops. For once, a Newton product – the eMate 300 – makes it to a “best-of” list instead of the usual what-were-they-thinking roundup. Better known as the PDA That Never Stood a Chance, the eMate was a stripped-down, retooled Newton built exclusively for students and teachers. With a near-30-hour battery; 480×320 resolution, backlit, touch-screen display; serial and IrDA ports; full-sized keyboard; and Newton OS 2.1, all housed in a tough, translucent-blue clamshell case with an $800 price tag, the eMate was a revelation that came at precisely the wrong time — about four months before Steve Jobs regained his position as Supreme Ruler. 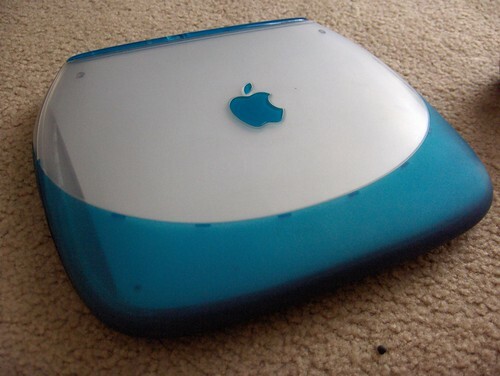 Lists like this are conversation-starters, and I’ll take the bait, because I disagree with listing the iBook G3 clamshell as one of the worsts. The magazine pokes fun at the design of the iBook (“equal parts toilet seat, suitcase and clam”), which is purely subjective, while it ignores the clamshell’s functionary details. The same features Apple pioneered with the original iBook – the handle, the ruggedness – were never seen again after the IceBook replaced the clamshell model G3, which perhaps says something. Some Apple laptops, like the PowerBook 5300 series (hilariously called the “HindenBook” for its ability to spontaneously combust) and the Mac Portable, seem to end up in the scrap heap in every list. 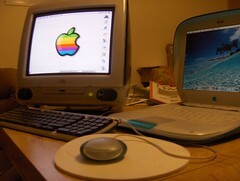 Macs like the Twentieth Century Macintosh and the Titanium PowerBook go either way. Still, it’s nice to see the eMate get some positive recognition for once. Posted by davelawrence8 at 6:26 am on November 25th, 2008. No comments... » Categories: eMate, ibook, macs. Tags: 300, 5300, clamshell, eMate, G3, ibook, list, maclife, newton, powerbook. Subscribe via RSS. I try to practice what I preach, so when my grandma’s old Packard Bell computer exploded, I bought a used blueberry iMac G3 to fix up and upgrade for her to use. The iMac bears the scars of its duration in the public school system, but it still chugs along. I bought a 256 MB SO-DIMM RAM chip for it, thinking it would help pull a new Panther install along on the 333 MHz machine, but I think grandma’s model was one of the iMacs that will only recognize some of the RAM it’s given. Given that, it seems 256 MB of RAM would be better used in my iBook G3 333Mhz blueberry clamshell. Posted by davelawrence8 at 5:34 am on November 16th, 2008. No comments... » Categories: DIY, lowend, macs. Tags: bondi, clamshell, DIY, G3, ibook, imac, install, pc100, pc133, project, RAM. Subscribe via RSS. Like the iMac, the iBook was designed not to be an instrument of utility but an object of desire; like the iMac, it was designed to be a pleasure both to look at and to use; like the iMac, it was designed to be designed, and by introducing it a year after he introduced the iMac and two years after coming back to Apple, he made it clear that he was not going to play the same game as those whose idea of technological innovation was beholden to the number of transistors that could fit on an integrated circuit. Amen. The iBook G3 clamshell is still a joy to behold, even though the translucent plastic look has been gone since the G4 series. It was rugged, truly portable, and very Apple. “It might not have worked” is a pretty strong statement, don’t you think? Is the Newton experience “crappy”? Posted by davelawrence8 at 7:05 am on November 14th, 2008. No comments... » Categories: jobs. Tags: apple, clamshell, esquire, G3, ibook, messagepad, newton, newton poetry, PDA, steve jobs. Subscribe via RSS. I was just reading your Sunday project to install a wireless card in your iBook. It seems relatively easy to do and was exactly what I wanted to know about. I just wanted your opinion. I’m in grad school and am going to China for 2 weeks in May on a school/business trip. I want to bring a computer but I’m too nervous to bring my MacBook Pro. I found a clamshell laptop on ebay for a really good price. Do you think if I buy a new battery for it and install the wireless card it would be a good laptop to take with me? I haven’t bought it yet. I just wanted someone else’s opinion first. I pretty much just need it for internet and word processing. I figure it would be a rugged computer to take on such a long trip. Any tips, advice, opinions would be great. Good question! In fact, that’s exactly what I bought my G3 iBook for – I drove Route 66 a few summer ago, and felt too nervous to take my then-new iBook G4. So I did what you did: shopped on eBay and got a cheap clamshell. I stored all my photos, sent all my e-mails, and kept my travel journal on the G3, and it was perfect. I just wish I had my Airport card then, because just about everywhere I went there was wifi. I think it would suite your needs perfectly. They’re rugged as heck, and the wireless standard Airport uses is pretty universal. You should be able to hookup just about anywhere. The battery part may be a bit trickier, but I know there are some online retailers that sell them. You could find one on eBay, too. Good luck on your trip, and good luck clamshell shopping! Posted by davelawrence8 at 1:27 am on April 15th, 2008. No comments... » Categories: DIY. Tags: airport, apple, china, clamshell, G3, ibook, macbook, mail, messagepad, newton, travel, wifi. Subscribe via RSS. Clamshell iPhone: is this the iPhone Nano? The folks over at UnwiredView.com have posted mock-ups of a clamshell iPhone design that’s based on Apple’s own “dual-sided trackpad” patent drawings. The main idea with this device is to separate capacitive touch sensor array and the phone display into two separate units. Then put the touch sensor array on a translucent (transparent) panel, make this panel touch sensitive on both sides – top and bottom and connect them with a hinge. It’s a pretty cool idea – a smaller, multi-use hinged piece that swings down and serves as the main control. What interested me was the part about drawing phone number digits with your finger and having the iPhone recognize them. Sound familiar? Instead of “handwriting recognition,” it would be “fingertip recognition.” And this wouldn’t be simple iPod or picture editing controls either. We’re talking about drawing a two with your index finger and a “2″ coming up on-screen. Sounds an awful lot like our favorite green machine. I like the clamshell idea because that’s how I like my cell phone. The Samsung model I currently carry is a flip phone. It folds up nicely into my pocket. Take that idea to the iPhone, and you’ve got what you see in the pictures at the top – sort of an idea for the iPhone Nano. Even Unwired admits this is all speculation, and while their renderings are crafty, they probably have no relation to anything Apple would release. Few people get these kind of things right. Apple ends up blowing all the posturing away with a design so slick it beats whatever the Photoshop twerps come up with. Still, drawing digits on an iPhone? The Newton idea keeps popping up. Posted by davelawrence8 at 7:20 am on March 21st, 2008. No comments... » Categories: ipod/iphone, newton, rumors. Tags: apple, cell, clamshell, flip, iphone clamshell, iphone nano, nano, newton, phone, samsung, unwired. Subscribe via RSS. On this day eleven years ago, Apple released the Newton eMate to try and reach the education market. Applefritter has a nice rundown of the eMate’s abilities, but I’ll tell you: they’re so cheap on eBay now I’ve thought about getting one. I like them because, in a way, they’re the harbingers to the original clamshell iBook G3 – my favorite Apple portable of all time. Unlike the handwriting-based MessagePads, the eMate is keyboard-friendly. It sports an ARM 710a 25MHz RISC processor (view more technical details here) and hosts a word processing program, a drawing program, spreadsheet, address book, calendar and graphing calendar. Posted by davelawrence8 at 7:34 am on March 7th, 2008. 27 comments... » Categories: eMate, milestone, newton history. 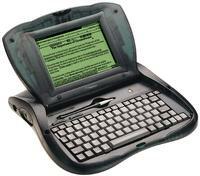 Tags: 1997, 300, apple, clamshell, education, eMate, green, ibook, keyboard, messagepad, newton, portable. Subscribe via RSS. I love my G3 iBook. I bought it right before my Route 66 trip because (a) I was nervous about taking my then-new G4 and (b) the thing is built for road-warriors and students. It’s the toughest laptop I’ve ever seen, and I knew if I took it all the way across the country, it would survive in a pinch. And it did, both on the Route trip and the Seattle trip. But one drawback was its lack of wireless connectivity. I underestimated the number of hotels – even run-down ones – that have wireless internet these days. One night, in Needles, California, I drove to three different hotels looking for an ethernet connection, never finding one (which is one reason why the Route updates didn’t come as often as I wanted). Posted by davelawrence8 at 4:32 pm on March 2nd, 2008. 35 comments... » Categories: DIY, howto, ibook, lowend. Tags: airport, airport card, airport express, apple, blueberry, card, clamshell, DIY, G3, ibook, project, WEP, wireless. Subscribe via RSS.